Injuries continue to run rampant in Major League Baseball, and on Thursday, yet another ace landed on the DL. 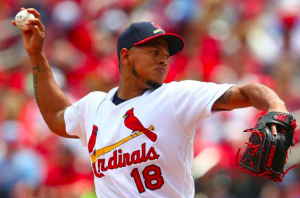 The St. Louis Cardinals have placed Carlos Martinez on the 10-day DL because of a lat injury. The extent of the injury is unclear at this time, but it will keep Martinez out of commission for at least a week and a half. The St. Louis ace also joins what has become a crowded Cardinals DL that also includes catcher Yadier Molina and several key pitchers. Martinez last started on Tuesday and wasn’t quite his dominating self. Pitching against the Twins, he lasted just five innings, giving up four runs, although only two were earned. That start broke a string of six consecutive starts in which Martinez allowed one run or fewer. Outside of a rough opening-day start against the Mets, Martinez has been close to un-hittable this season. Unfortunately for Martinez, his brilliance early in the season hasn’t translated to wins. Through eight starts, he’s just 3-2. However, he has a 1.62 ERA over his first 50 innings of the season. Opposing batters are hitting just .187 against him. The Cardinals can only hope Martinez can recover quickly and pick up where he left off. If he does, Martinez could end up having the best season of his career and being a serious threat to win the Cy Young. The loss of Martinez drops the Cardinals to three starting pitchers on their active roster. St. Louis could potentially activate Adam Wainwright to take Martinez’s next start. Wainwright has been on the DL for over two weeks because of inflammation in his elbow. Wainwright pitched five innings in a minor league rehab outing on Tuesday, so the Cardinals could call him up as early as Sunday when he’d be on regular rest. But it’s unclear if the Cardinals want the 36-year old Wainright to make another rehab start or not. With Martinez out, the Cardinals may also need to recall Jack Flaherty to take a spot in the rotation. Flaherty has already been called up and optioned to the minors multiple times this season. In two big league starts, he has a 3.60 ERA. In between those starts, he’s excelled at triple-A, going 4-1 with a 2.27 ERA, so the Cardinals should not be hesitant about having him rejoin the rotation. Despite a couple options on how to replace him, losing Martinez to the DL is a tough blow for St. Louis. The Cardinals began Thursday leading the NL Central. However, the Brewers and Pirates are just half a game behind them, with the Cubs a full game back. With the division that tight, every start that Martinez misses could end up having a profound effect on the final standings.